BANGI, 15 Aug 2012 – Students of The National University of Malaysia (UKM) outshone their rivals in five prestigious national and three international events held so far this year. Their accomplishments were recognised by the university’s Divisional Heads comprising Faculty Deans and Directors of Institutes and Centres at their meeting here today. Its student, Shay Lee Ng won the first prize of US$1,000 in the individual category at the competition. A robotics soccer team from the Faculty of Information Science and Technology (FTSM) which won the 6th FIRA (Federation of International Robotics Association) Malaysia Cup 2012 which was held at Seberang Prai on June 25 to 29 will represent Malaysia at the International Robot Soccer Championship in Great Britain later this month. 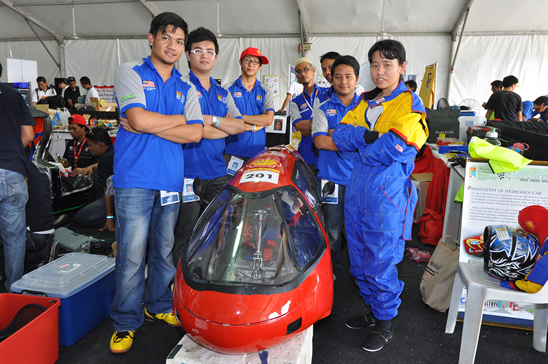 The Solar, Fuel Cell and Ethanol team from the Faculty of Engineering and Built Environment emerged winners at the Shell Eco-Marathon Asia Championship 2012 in the urban concept car category with solar power at the Sepang International Circuit on June 7. They won a cash prize of US$2,000 and a trophy. The university’s theater group, ARTISUKMA from UKM’s Cultural Centre bagged top prizes in five categories at the Festival of Arts Council Theatre Championship for local Universities (MAKUM) held at the University of Malaya from July 1 to 8. It won for Most Promising Actor, Best Direction, Best Adaptation, Best Lighting and Best Music. Students from the Department of Physiology, Faculty of Medicine won the first prize in the “Young Investigator” competition at the 46th Malaysia-Singapore Congress of Medicine held in the island republic on 14-16 July. They were Megat Mohd Nordin, Nor Anita, Norizam Salamat, Azmir Ahmad, Omar Musmarlina, Zaiton Zakaria, Wan Wan Ngah Zurinah, Oteh Maskon and Kalaivani Chellapan. One of its PhD students, Wan Mohamed Wan Fakhrul Razi from the Department of Arabic Studies and Sunnah, Faculty of Islamic Studies emerged the champion reader at the Al-Quran recitation championship among local universities held in Kuala Lumpur in July. A team from the Faculties of Engineering and Built Environment and Economics and Management finished third in the design and engineering category for the Eco-Challenge from July 13 to 15 at the International Motorsports Circuit in Melaka. They received a cash prize of RM5,000, a trophy and medals. Seven students from the Faculty of Economics and Management won the top prize of RM7,000 at the 1Malaysia Convention for Young Entrepreneurs’ Challenge in Shah Alam from July 18 to 20. They are members of the “Free Enterprise Students’ Club” of UKM.